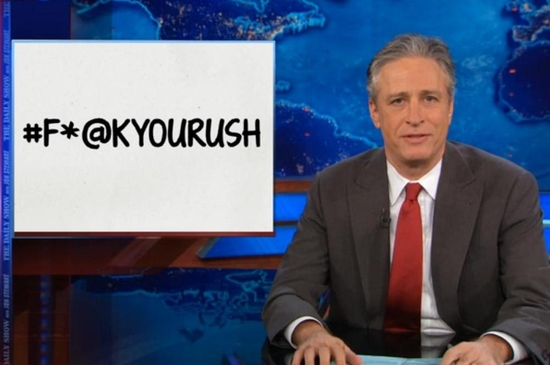 Jon Stewart launched a hastag war with Rush Limbaugh Monday night that lit up Twitter into late this morning. Stewart featured a report on the Boko Haram terrorists holding more than 200 schoolgirls hostage in Nigeria. During the report, he discussed the #BringBackOurGirls Twitter campaign in which various celebrities, activists and politicians around the world used the hashtag to create international attention that forced the Nigerian government to act. Stewart noted that the “hashtag activism” did succeed in shaming Nigeria into accepting international help in locating the girls. And, then for Stewart, it was on. Showing a photo of Malala Yousufzai, the young Pakistani student-turned-activist who was nearly killed because she sought an education, with a #BringBackOurGirls sign and one of Rush shouting, he demonstrated the choice to the audience. Twitter responded in a big way with the NSFW hashtag hitting a worldwide trend right behind #BringBackOurGirls. As we continue to see more “Hashtag Activism” Twitter’s role in creating awareness and driving donations should be noted by all fundraisers, activists, non-profits and politicians. I agree! Rush is complaining, but the campaign brought awareness to the issue and the world community is taking action. Social media can be a powerful tool for good. Good thing for symbols or we’d be looking at this: #FASTERISKATKYOURUSH.